About the A.K.E.A. – A.K.E.A. 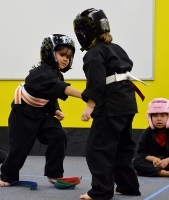 In addition to his martial arts training Mr. Harmaning brings over 30 years of professional education experience to the teaching of martial arts. The AKEA makes sure all A.K.E.A. 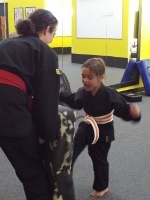 instructors have training in teaching methods which goes far beyond the typical “kick and punch” and “have-a-black-belt” credentials most martial arts instructors possess. Mr. Harmaning began training in martial arts in 1968 when they were still relatively new in the United States in Shorei Kempo in Twin Falls. When his instructor moved away shortly thereafter Mr. Harmaing began studying with Mr. Robert Tidd who had jjust recently switched karate systems and had received his Shodan from Masters Raymond Tobosa and subsequently joined “Tobosa’s KAJI-Kumi art of Self-defense.” This was to be Mr. Harmaning’s primary martial art and Master Raymond Tobosa his primary teacher until 1987. In 1973, he took the NNU karate class to Twin Falls for the first KAJI-Kumi tournament and seminar sponsored by Robert Tidd. Master Raymond and his brother Toby gave an amazing Escrima demonstration which was the first on the U.S. mainland of Tobosa Kali/Escrima. After placing first in brown belt forms and sparring, Mr. Harmaning was awarded his Shodan from Master Tobosa himself. In those days, there were few formal tests. As students had trained and their skills improved, they were awarded ranks. No time limit was set, and students never questioned how long between tests. Students knew that if they didn’t get ranked, they weren’t ready. 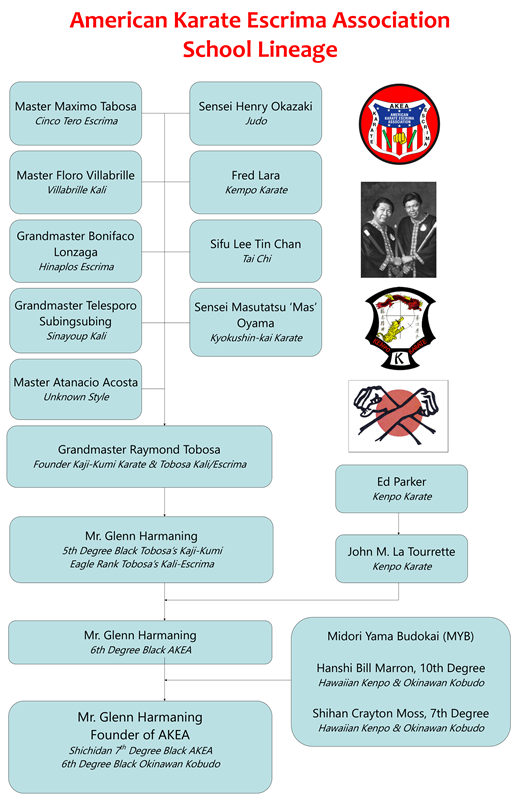 Although Master Raymond’s karate was from the hard Japanese Kyokushin style, Mr. Harmaning essentially defined and standardized what the “karate” aspect was of Tobosa’s KAJI during 1975-1978. Master Raymond once told him, “If it makes your karate good, then do it.” Mr. Harmaning has followed that advice literally. In 1977, Mr. Harmaning met with Master Tobosa in Las Vegas, tested for new ranks, and became the one of the mainland directors of Tobosa School of Kali/Escrima and Tobosa KAJI-kumi School of Self-Defense along with Michael Mulconery and Rick Hills. At this 1977 meeting, Mr. Harmaning was awarded his third degree black belts (Sandan). In 1982, Mr. Harmaning began teaching in conjunction with Mr. Crayton Moss, athletic trainer for NNU who held black belts in Hawaiian Kenpo and Okinawan Kobudo (weapons). Mr. Harmaning became close friends with Sensei Moss and began in earnest training with the traditional Okinawan weapons (bo staff, sai, tunfa, nunchaku, kama, and oar.) However, the Kali/Escrima skills were to his view far more usable for self-defense than the traditional Okinawan weapons. Mr. Harmaning wanted to improve the methods that he was now using. Once he had completed his college degree in Education, Mr. Harmaning knew that there were better ways to teach than the traditional ways of mass group instruction only. So in 1986, he stopped teaching the sport karate format of all group instruction and leased a 2,300 square foot building and opened the “The Idaho Kenpo and Karate-Do School of Self-defense”, a full-time martial arts school. He now based all his teaching on private lessons and taught skills which focused on self-defense and street fighting. Traditional karate methods of teaching were not as effective as they could be, because they didn’t fit proven educational and psychological principles nor did they fit into realistic self-defense for modern applications. In the fall of 1987, Mr. Harmaning relocated to Kent, Washington to return to teach Junior High School full time. 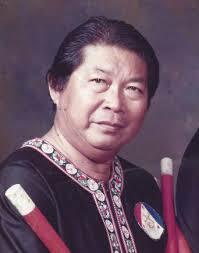 After October 1987, Mr. Harmaning no longer acted as mainland director of Tobosa’s KAJI or Tobosa’s Kali/Escrima. During Mr. Harmaning’s last conversation with Master Tobosa, he wished Mr. Harmaning well and to continue on the direction he was going. In the fall of 1987, after great thought, research, and planning, Mr. Harmaning established the AMERICAN KARATE-ESCRIMA ASSOCIATION. He wanted to move away from strictly Japanese karate or strictly Kali/Escrima format taught at many schools. 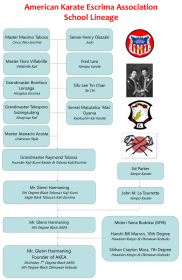 Mr. Harmaning chose the name “American Karate-Escrima” because he wanted to preserve some of the important martial art traditions that have their origins in Japan and Okinawa exclusively and have formed the very heart and soul of what the A.K.E.A. practices today. faster methods of the Chinese and Filipino arts. Believing, also, that self-defense can be learned best by practicing for self-defense, he arranged the rank structure around a vast array of self-defense techniques and fighting skills. Students would thus be familiar with many combinations and applications of self-defense. He expanded the original four belts of “KAJI” to eleven belts before black belt to aid in short-term goal setting and motivation for students. In June of 1994 Shawn Noble, under the guidance of Mr. Harmaning, opened up the Auburn A.K.E.A. School of Self-Defense. This is also when Mr. Craig Moore’s involvement in the system began. Auburn A.K.E.A. School has now been open for over 22 years touching the lives of hundreds of students. In 2005 Mr. Harmaning renewed his association with Sensei Moss, inviting Sensei Moss out yearly to run a Kobodo camp at the Auburn school. 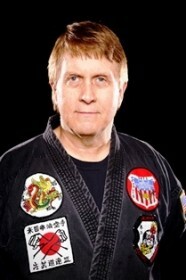 On July 10, 2009 Mr. Harmaning was awarded his 7th Degree Black Belt (Shichidan) by the Midori Yama Budokai Association.